February 15, 2013 by Laurie 6 Comments This post may contain affiliate links, which means if you click on a link and purchase something, I may earn a small commission (at no additional cost to you.) See my disclosure policy HERE. If you enjoy this recipe, I’d sure love for you to “share” it on Facebook or “pin” it on Pinterest ~ just click the buttons above. Thanks so much for supporting PPP! This is my all-time-absolute-best-slow-cooker-pot-roast-on-the-planet recipe, and if you haven't tried it yet you've got to add it to your menu plan this week! I'd love to hear if you have other ways to cook your roast, but this one (at least right now. . . ) is our family's favorite. I've tried way too many pot roast recipes to count. . . fairly unsuccesfully. (At least according to my not-always-impressed-with-my-penny-pinched-meals hubby.) But when I saw shoulder roasts on sale at Publix this week, I was determined to get it right, and I think I finally did! I realized that the biggest problem with the pot roasts that I've tried in the past has probably been the cut of meat ~ I thought that because everyone said to use a chuck roast, that was what I needed. But I don't think think I'll ever use another chuck roast again! The original recipe called for 3 tbsp. of Worcestershire sauce, but when I couldn't find it in the pantry I decided this Beefy Mushroom soup might just work. It worked, and was really, really good. In fact, my son said it was the best recipe I've ever made and decided that we needed to pack up our slow cooker for our next family vacation. 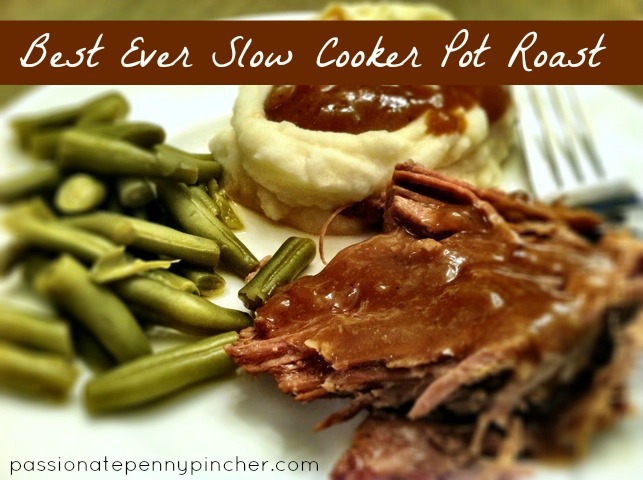 Yup, this is my new Slow Cooker Roast Winner! I'd love to hear what you think if you try it out. 2-3.5 pound roast I used a shoulder roast, I'll never try any other kind because this one was so good! Mix together flour, salt, pepper, and garlic powder in large plastic bag. Put the roast in the bag and shake it until completely coated in flour, then brown all sides in large skillet in olive oil. While the meat is browning, add your onion slices to the bottom of the slow cooker. Cook 9 hours on low heat in slow cooker. Serve with mashed potatoes, veggies, and (of course!) gravy. Remove 2 cups of the broth and place in saucepan over medium heat. Add bouillon and stir until it's completely mixed in to the broth. This was our Sunday lunch after church today. I put it on while the kids ate breakfast and cooked on high for about 4 hours with potatoes and carrots in the pot. Came out great! I mixed the leftover beef and gravy with some peas in a casserole dish and turned the potatoes in to mash for the top. Shredded cheese on top and I’ve got a sort-of shepherd’s pie made for Tuesday night’s meal. Thanks!! My husband says this is the best beef he has ever eaten and that says a lot because he is always nit pickin my food.the only thing I did different was I used golden mushroom soup instead of beefy mushroom I couldn't find it .but still delicious and I will be making again! I live in Canada and can’t find Beefy Mushroom soup. Any suggestions for a substitute? I am not a fan of the regular mushroom soup recipe either. Thanks so much! Do they have Golden Mushroom? Even here very few stores carry the Beefy Mushroom (definitely my favorite), but the Golden Mushroom will work much better than the Beefy Mushroom. Hope tha thelps! I always use chicken mushroom soup when a recipe calls for a cream soup. In this case, since you are adding beef bouillon anyway, any soup you like should work. Or making your own is simple to do.